Harken back to the first years of the big screen. Back then, a movie could last a few seconds or a few minutes and still be considered a movie. All the movies were silent movies and live musicians were hired to play songs to accompany the storyline being acted out on the screen. Fast forward ninety years to today and you would be pressed to find anyone who can relate to that period in cinema history. Still, for film buffs and those with a certain affinity for the full, orchestral sound cinema organs provided, finding theatre organs in Melbourne, of all places, can be quite the thrill. The era of silent films stretched from 1894 - 1929 before the advent of talking pictures. During that thirty-year period, thousands of theatre organs were installed in picture shows around the globe. As early as 1895, silent films that were being shown in Paris, France were played to a live musical accompanist, often in the form of a piano player. Larger metropolitan areas typically had an organist or a small ensemble of musicians whose job it was to play along with the film. Theatre organists were preferred to solo pianists because the organ delivered a much fuller sound. Back then, films were not professional scored in the modern sense of the term. No. Instead, theatre organists would either improvise the score or play pieces from a pre-existing catalogue of tunes. By the height of the silent film era, theatre organists were largely considered well-respected artists and composers. Oliver Wallace, who got his start as a theatre organists, went on to compose for Walt Disney. Jesse Crawford was so famous as a theatre organist in the United States that he sold more than a million recordings of his playing. Other notable organists include the UK's Reginald Dixon, Rex Koury (composer of the theme for Gunsmoke) and perhaps most famous of all was George Wright. These gentlemen not only played the organ, but many of the wrote original musical pieces specifically for the theatre organ and had a hand in helping the instrument to remain a viable part of the cinematic experience well into the early 1960s, thirty years after audio was added to film. Even when talkies (a colloquial term for talking pictures) were running in theatres around the world, theatre organs, across Europe and in North America provided welcome live music for movie patrons during intermission. These days, the films that reach your local movie theatres are already scored. The film images are synchronized with the score, the sound effects and the movie dialogue. So the cinema organ is not featured precisely in the same way it was during the last century. However, the stirring, distinctive sound of theatre organs in Melbourne are still cause for celebration. But fret not. 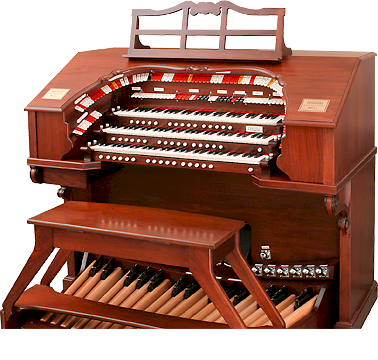 If you really want to hear them, theatre organs are still prominently featured as orchestra pit staples in some of the most beautiful and famous concert halls. And, of course, in private homes around the world.